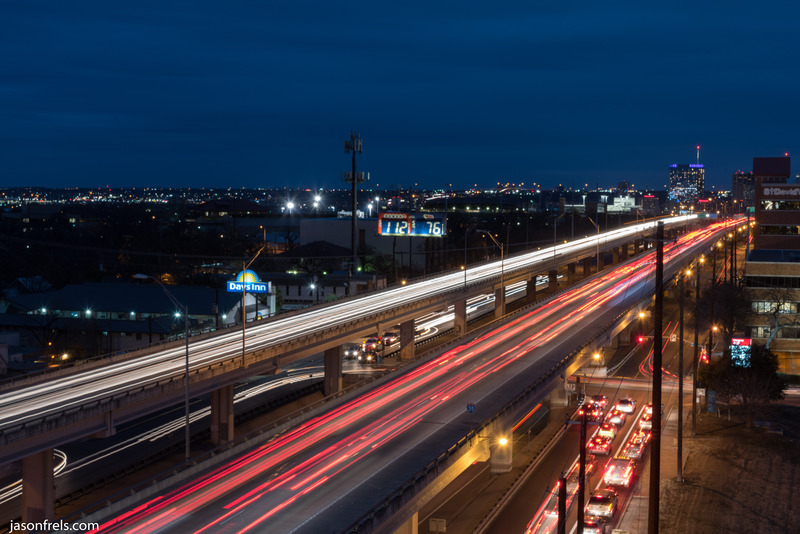 I had been wanting to find a decent place in Austin to take some long exposures of traffic in the evening. I haven’t done much of this before and I wanted to give it a try. I found a parking garage next to I-35 that was open and I drove right up to the top. I set up my tripod and tried to face downtown. Downtown is off to the right and I couldn’t really get the highway and downtown in the shot from this vantage point. If they had just been kind enough to build this parking garage on the East side of the freeway, I could have made that work. Maybe if I get a wider lens someday. Below is one of the best photos I got. The lights trail off into the distance to a few building. It was rush hour traffic and it was moving very slowly, so I didn’t get the continuous stretched out red lines that I was hoping for. I got a lot of brake lights. This was a 13 second exposure, at f/16. I am going to search for a better vantage point to see if I can get downtown and a highway in the picture. 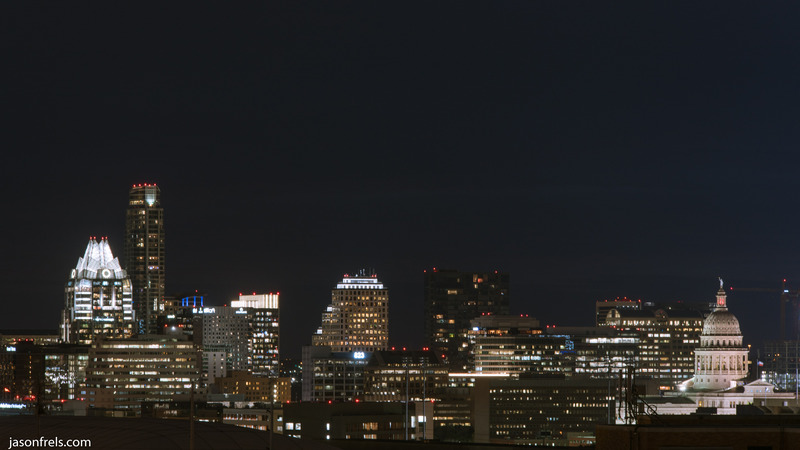 I also took a picture of downtown using the 200mm lens. I chose 200mm because on the left there is a large parking garage and to the right is a construction crane and I didn’t want those items in the shot. I was actually going for HDR, but there was a lot of wind which resulted in too much camera shake for the long exposures. So, I may try that again on a calmer evening. Below you can see the Texas State Capitol Building and some of downtown. That was a 3 second exposure at f/11, during a short break in the wind. It was very cloudy and the sky got dark in a hurry. 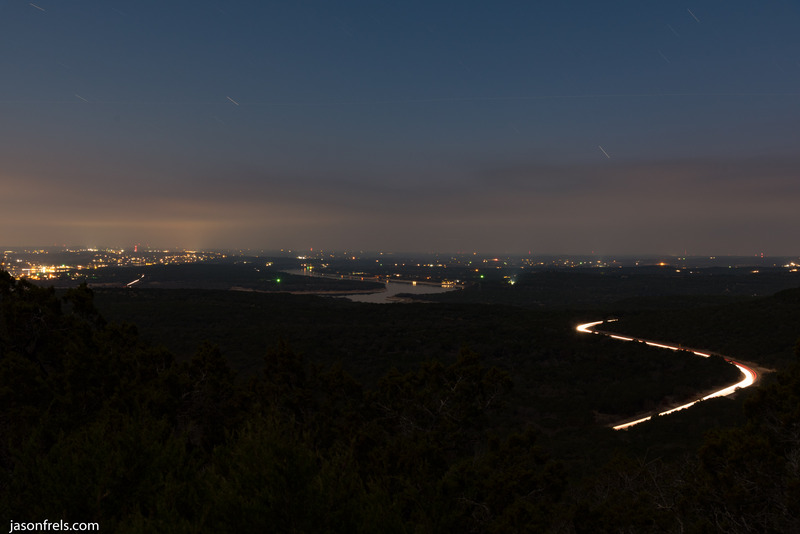 A few days later I decided to go to the sunset deck at the Balcones Canyonlands National Wildlife Refuge. The sunset wasn’t anything to write home about, but as the sky got darker I wanted to try to get some long exposures of the highway down below and perhaps some cloud blur. The image below is a 30 second exposure and I managed to get a few cars going up and down the highway with the slowly moving clouds above still visible. 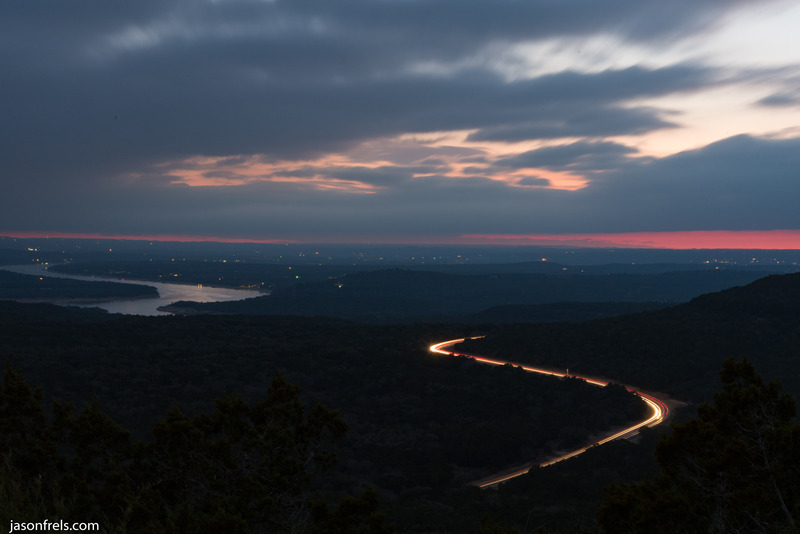 As an unplanned bonus, I like how the curve of the lights on the highway mirror the curve in Lake Travis in the background. When it got really dark, I was able to do some much longer exposures. Below is a little over 4 minutes exposure with a lot of headlights and taillights on the highway and the city lights in the distance. You can also see some stars streaking to the western horizon. If you look close, You can also see the trail of an airplane moving across the top of the frame. To take long exposures greater than 30 seconds, I used a remote shutter release in mirror-up mode. The first button press raises the mirror, then a couple of seconds later I pressed the button again to open the shutter and I also started a timer on my phone. I wait for the mirror to go up first so that it doesn’t add camera shake. When the timer gets to my target duration, I press the button again to close the shutter. The camera then takes a noise reduction frame for the same duration. I was going for about 4 minutes, but I stretched it another 11 seconds to let a car finish going down the road. With exposures this long, it isn’t very important if you are off by several seconds. I also have a 10 stop ND filter that I tried using, but I got much better results by waiting until it got dark.